Wire baskets are the ideal way to store or transport both fragile and solid goods. Fabricated of strong steel, they provide protection on all sides for goods. When storing goods over a long period of time, these containers are resistant to any bumps from internal equipment. They provide a neat holding place and can also be stacked to save space. Many styles come with options for casters. If the container needs to be move from one location to another within a storage facility, wire baskets with caster make for easy transport. If your company ships containers on a regular basis, wire baskets can secure the product over long distances. Wire baskets come in all sizes and different styles. With drop gates, these practical storage containers can easily be collapsed, stacked and stored neatly in any facility. This makes for an efficient use of interior space. Companies also have options to have wire baskets custom designed to meet unique needs. Choose the size, the gauge of steel, load capacity and size. Having a wire basket build to your specifications will ensure that you get a wire basket for your range of applications. Today, wire basket fabricating companies offer an even broader range of wire baskets. These containers can be made of plain steel, stainless steel or galvanized steel. Interlocking, stitched partitions, suspended sling systems and plain or protective laminated surfaces with specialty die cut are available. Wire baskets with lids are ideal for product protection on all sides. Wire baskets with handles make it easy to lift and carry. Baskets with dividers ensure organization and protection from one product to the other. In addition to storage, many industries require wire baskets in their production process for parts washing, ultrasonic cleaning, heat treating or to degrease parts. Wire baskets used for these types of applications are typically custom ordered. The design of the wire basket is dependent on whether or not the basket will be exposed to high temperatures and the optimal number of parts in the basket. With today’s technology, these wire baskets are constructed in a welding department using robots to make the dimensional parts and to weld parts together for high tolerance. Typical finishes include epoxy coating, chrome plating, electro polish and nylon coating. Antimicrobial coatings can even be applied for infection control. Once the wire baskets are completed, they are shrink-wrapped, packed securely and delivered to the customer. Along with having wire baskets custom fabricated, companies can save money purchasing used wire baskets or sell their old ones back to the company that they purchased them from. Some companies that sell wire baskets act as third parties and will negotiate a sale with a new buyer. It’s the ideal way for businesses to save on operating expenses and achieve maximum ROI. Getting a quote for wire baskets is easy. Most companies today offer online quote forms for a quick price. For custom orders, they offer one-on-one consultation to discuss your unique needs. Application needs and design will be thoroughly discussed to ensure the product is to your specifications. 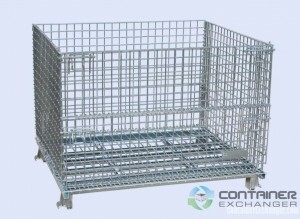 Standard sizes are 40x48x36, 40x48x42, both galvanized wire baskets with and without drop gates. 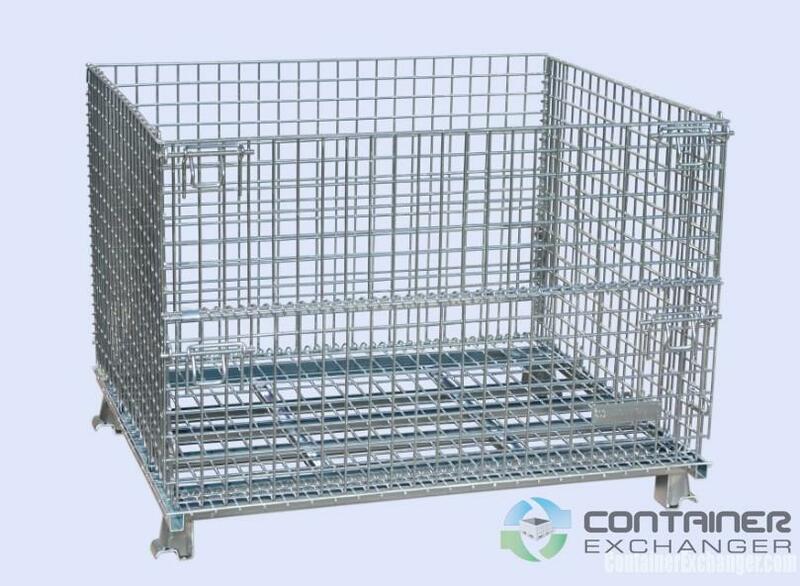 We have also have rigid wire baskets for heavy-duty applications. This entry was posted in Bulk Containers, Wire Baskets on November 25, 2013 by madden_david. Buying used wire containers is a great way to save money and time, as well as to be more environmentally friendly. If you’re looking for an easy to clean and collapsible bulk container, consider using wire containers. Slightly different than steel sheets, wire containers are exactly how they sound – made out of a type of wire mesh. Some are created with light-duty wire for easy transportation. These are great for carrying; however you’ll need a heavier wire for bigger and heavier items. You can buy heavy-duty wire bulk containers for those items that require something sturdy to transport them. Wire containers can come in a variety of styles and sizes to suit your needs. They can either be rigid, or collapsible depending on what you are transporting. Wire containers are made to last for many years to come. Some of them can hold over 6000 pounds of material, making them a great option for those shipping heavier items. 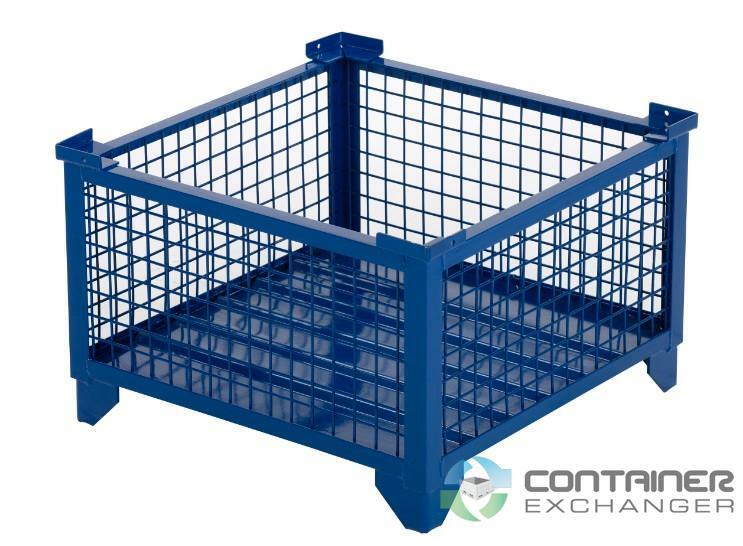 If you’re searching for wire bulk containers at a great price, you can find used collapsible wire baskets by doing a quick search online. One of the most popular websites to buy used collapsible wire baskets is www.containerexchanger.com. They offer a great selection of used collapsible wire baskets and have an easy to use interface that will allow you to find exactly what you’re looking for. If you have wire containers to sell, you can also exchange them through their website and make a bit of money. Many businesses are feeling the pressure of today’s downward spiraling economy. Add the rising cost of oil into that equation, and companies with shipping and transportation expenses are greatly suffering. Many of these companies are searching for effective ways to reduce their operational costs. One of the best ways to do this is by buying used shipping containers. Also, you can sell used wire baskets. Some may be weary of buying used shipping containers to transport their valuable products. The truth is, shipping containers like wire containers are extremely durable. They can last through many bumps and scrapes, without reducing their effectiveness. Unless you are displaying your shipping containers, the way they look is of little importance compared to how they operate. Buying used wire containers is also a great way to save time and avoid the hassle when you need to order new containers. Websites like containerexchanger.com allow you to buy second-hand containers that you know are in stock. There’s no need to wait around for your order to be processed or risk them being on back order. These containers are clean and ready to go. Many companies are becoming more environmentally friendly as they start to realize what kind of impact they have on the world around them. Buying used wire containers is a great way to keep them out of the landfill. Many customers appreciate small changes like this and enjoy knowing they are supporting a company who respects the environment. Why not reduce your carbon footprint and improve your bottom line at the same time? And when you no longer need your shipping containers, you can recoup some of your costs by selling them on the same website you bought them from. It’s a win-win situation. This entry was posted in Bulk Containers, Wire Baskets on November 20, 2013 by madden_david.